Are you planning a craft beer wedding party or reception? Do you and your significant other love crafting beer or even just enjoy drinking it? 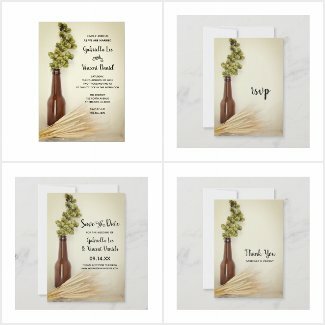 If you're planning a beer theme wedding, we think you'll LOVE this rustic dried hops and wheat brewery wedding invitation design. The custom design featuring a brown bottle being used as a vase with a dried hops bouquet and a sprig of wheat laying in front of it can only be described as casual-elegant. ​ at their marriage reception." 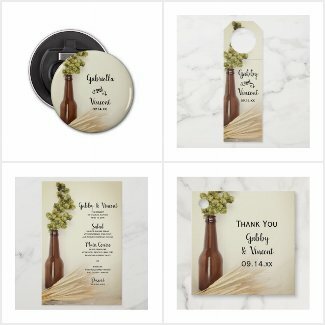 All of our featured invitation collections are brought to you by the artists who keep shop at Zazzle.com, a world leader in custom and personalized paper, apparel, home decor, and gift items. You'll be happy to know that everything sold at Zazzle comes with a 100% satisfaction guarantee. Visit to see all of the matching items that you'll want for the wedding reception including gift tags, personalized paper napkins, bottle openers, table numbers, paper coasters, and more! Cute Gift Idea for the Bride and Groom!